It was the summer of 2009, Will totaled his car and didn’t replace it. That’s how I ended up being a year round bike commuter. I certainly didn’t choose it, but there’s something about new love that makes you gung-ho for anything. My very first time riding in snow. 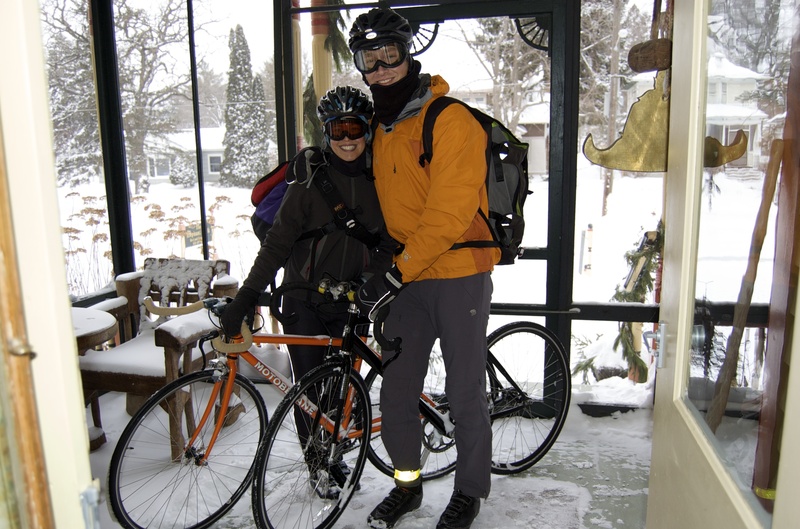 We biked to a bed & breakfast in the first winter storm December 2009. Lots of things have changed since this epic learning experience. People bike commute in all sorts of ways. My mom rides a tiny folding bike for social outings. She will decorate herself in a sparkly cape for visibility. My brother in law will bike shirtless in his dress slacks to work, the rest of his suit in his backpack. I’ve tried different bikes, different clothes, different packs, and different methods. Lots of friends ask what works for me. Here it is. It needs to be as simple and easy as possible. My house, my wardrobe, everything is set up so that choosing biking over driving doesn’t take extra time. I tried panniers; screw ’em. They work on the bike, but not for lugging around in any other way. I tried bike shoes, screw those too. Tall leather boots work for October-April, they are far more versatile. Over time it’s become a system so that biking works fluidly with the rest of my life. I ♥ my lights and helmet. They make me feel safer. It’s been worth every penny to have super bright lights that are also super convenient to take on and off and charge. A bright headlight that makes people say “woah!” means they saw me. It also means it’s bright enough for me to see the potholes. It takes some time to find the best route. At first it’s just map consulting. Over time I’ve found new streets and paths and ask fellow commuters their routes. It can also be personal. Will likes the bike boulevard on 40th, I don’t care for it. He likes the bike lane on 11th into downtown, I prefer the one on Park Ave. It took time and exploration of all the streets sometimes only one block off the one I knew. Now I have routes I like and I enjoy it so much more. Winter is mostly just cold. I still don’t like biking in snow. Due to climate change and quick Minneapolis plowing, major roads are mostly clear most of the time. So mostly winter is just cold. The problem is no matter how cold it is, I’m going to still generate heat. So really it’s about keeping my toes, hands, and cheeks warm. I love liners inside lobster ski gloves, and my face protection. That and my metro Go-To card for taking the bus because sometimes it’s not worth it. I hate being cold. Arriving anywhere drenched in sweat is worse. I’ve also arrived in tears from being painfully cold. I have a method now so I start just a little cold and trust that I’ll be perfect in about a half a mile. I am an unlikely fixie rider. I ride a fixed gear bike year round. It wasn’t what I wanted, I was terrified of it at first. Now I wouldn’t trade it for anything. I still don’t ride it like your typical hipster. I can’t skid and I never learned to track stand. Not only do I have a front brake, I use it unapologetically. Everybody needs the bike for them at that time. It’s not what I started with but it’s perfect for me now. I got comfortable biking with other people who were already commuters. It’s made all the difference to have bike mentors to learn from. Now I pass it on as often as I can. I’m happy to bike with newbies. If you ask me about it, you’ll have trouble shutting me up. I’m committed to the lifestyle. Most of my friends are also part time or full time bike commuters. We bike places together, we meet places that we can all bike to. We understand when people show up wet, or are just too tired to show up at all. Just because I have a car doesn’t mean I’ll use it. This changes the scale of everything. My daily world is pretty small. It’s this change in perspective that can make me feel farthest away from non-biking friends. Not everyone wants or needs biking to be their committed lifestyle. But for the love of your health and our planet we should all live as simply and locally as possible? We all find the things that work for us to make that happen. What do you do? This entry was posted in Fitness and tagged bike commuting, biking, fitness, kymsfavorite, winter biking. Bookmark the permalink. I am an intermittent bike commuter. I definitely ride more in better weather, and I like to ride when it’s cold but not snowy or icy. Snow is rough, especially when you get the mushy stuff that builds up in driveways and around curb areas. I have a hard time getting my layers just right, which is what makes for far more difficulty in keeping it up in the winter. My feet and hands get either too cold or too hot, despite the numerous different attempts at layers for both. I would like to be better about riding all year round, and taking transit when I don’t. It is old snow and slush that’s the hardest to bike through. The scariest is when you’re not sure if the slush is soft or frozen. We call them ice bumpies when smooth round lumps of slush freeze. While biking is always faster than bussing, I do love taking the bus for how relaxing it it.